Gallery of the Absurd is very grateful to have been featured in newspapers and magazines across Europe. Deutschland and France are especially kind to us - thank you. 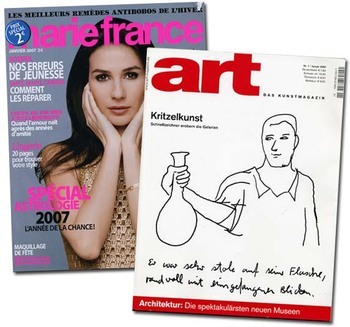 On newsstands this month, Marie France has a small feature on GoTA, and das kunstmagazin ART features our Brangelina and TomKat family portraits. In addition, GoTA is also featured here in the German Online-Newsmagazin RP Online and also in Velvet, a celebrity-themed Hungarian magazine. You shall rule the world, 14! ...who will be Pinky, though--I know! The Olsen Twins! Muhahahahahaha! Well, Europe is known for having more sophisticated taste, particularly in regard to art that mocks the establishment. Other than the celebrity culture that you skewer (some software and weapons), you, 14, are one of the only examples of a successful contemporary American export. Great, 14! Congratulations! You deserve more! Congratulations, 14. I am a great fan of your work. It is good to see a real artist recognized! I do sense echoes of Warhol's grasp of celebrity in your work, but where he mapped the surfaces, you plumb the dubious depths of your subects. Does that make sense? That's fantastic, 14 ~ congratulations on getting some of the international recognition that you deserve. Keep the absurdity coming, we love it!